Welcome back to FlixWorthy, your guide to Netflix streaming...and more. To help you navigate the new and notable streaming releases, each new installment of FlixWorthy will highlight new and/or notable releases on Netflix, but also on two other competitors who offer premium memberships to huge catalogues of content: Hulu (Hulu Plus) and Amazon Instant Video (Amazon Prime). We'll also sometimes include an a la carte pick from Amazon, iTunes, or elsewhere, for those of you who prefer to buy your shows by the episode/season instead of paying a membership fee. Here's what's FlixWorthy this week, kids. If you were one of the people – like our own Josh Tyler – who was in the midst of watching Stargate SG-1 on Netflix, you may have noticed that the service yanked it down a few days ago with little advanced warning. There's no word whether Netflix is negotiating to add the series back, but if you've been left in the lurch and you're also an Amazon Prime user, you're in luck. AP has the full, 10-season run of SG-1 available for streaming. Even better, if you're new to the Stargate franchise and get hooked, Amazon Prime also has all the seasons of the spin-offs, Stargate Atlantis and Stargate Universe. 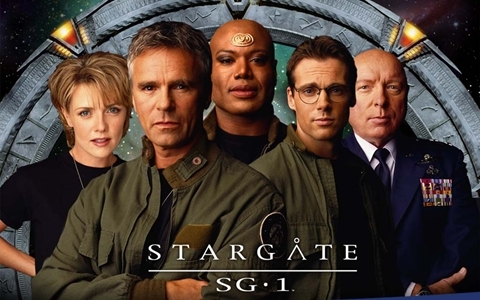 SG-1 picks up directly where the original 1994 Stargate movie left off. Michael Shanks steps into the James Spader role as Dr. Daniel Jackson, an Egyptologist whose work helped unlock the first Stargate found on Earth, and thus unlocked the wonders of the universe – both good and bad. For much of the series, MacGyver's Richard Dean Anderson takes over from the movie's Kurt Russell as Col. Jack O'Neil. Along with Major Samantha Carter (Amanda Tapping) and the alien warrior Teal'c (Christopher Judge), they travel the far-flung reaches of the universe, confronting the malicious Goa'uld and discovering other societies of humans who have been planted on distant worlds. Premiering back in 2007, Burn Notice is one of the shows that helped USA establish an identity when it comes to original content, along with series such as Psych and Monk. 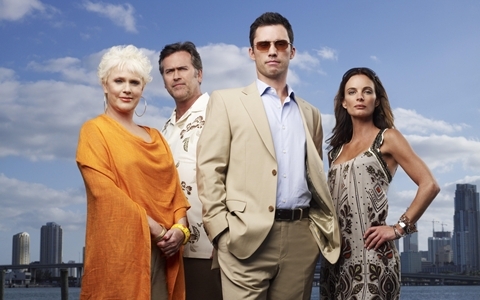 Burn Notice stars Jeffrey Donovan as Michael Westen, a secret agent who is inexplicably "burned," discredited and disavowed by the very government he served. He relocates to Miami, where his mother lives, and uses his training to help people, all while trying to discover why his employers kicked him to the curb. Often along for the ride are ex-Navy SEAL Sam Axe (Bruce Campbell) and Westen's girlfriend, Fiona (Gabrielle Anwar). I missed the boat when it comes to Burn Notice, something that's only become more annoying as friend after friend has glowingly recommended the show to me. That's why I was thrilled when Netflix added the series a while back, and I'm even happier to see that they've just posted season five. It's a perfect summer show, light and fun and action-packed, and it also gains several thousand Awesome Points for regularly featuring Bruce Campbell. (He even got his own standalone TV movie last year: Burn Notice: The Fall of Sam Axe.) Let the marathon commence! Hulu's first original series, Battleground is a documentary-style workplace comedy focused on the people working a political campaign to elect an underdog candidate to the U.S. Senate for Wisconsin. And by "underdog" we mean "waaaaay distant third place." The group is led by campaign manager Chris "Tak" Davis (Jay Hayden), who must deal with dogged reporters, corrupt politicians, and all the other perils of our electoral process. Battleground actually began life as a project developed for Fox. When that network passed on the show, it eventually found a savior in Hulu. Created and written by J.D. Walsh, Battleground draws on Walsh's youth in Wisconsin and the time he spent working on a political campaign for Massachusetts Senator John Kerry. Amazing Spider-Man director Marc Webb – a long-time friend of Walsh's – also worked on Battlefield as an executive producer. While the show hasn't received a second-season order from Hulu yet, Walsh has said that the possibility looks promising, so there may be more Battleground yet to come.